FIVE years ago, Mustafa Karimi arrived in Australia with no shoes and three items of clothing, having endured an exhausting 10 days travel by boat. Now he’s giving back to the community that reached out to him in his time of need. Mustafa’s perilous journey to Australia, necessitated by violent religious persecution in his homeland, is a timely reminder of the situation still faced by many in various parts of the world today. Raised in the small city of Parachinar, near the border of Pakistan and Afghanistan, Mustafa was just 5 years old when his life suddenly became surrounded by violence. “In 1996 a sectarian war started between two groups, Shiite and Sunni Muslims , and it engulfed the entire region,” he recalls. “I was very young and our school teacher was trying to hide us under tables because there were grenades and rockets going off everywhere. With attacks orchestrated by the Taliban becoming more frequent and more public in the coming years, Mustafa said no one felt safe anywhere. Having decided at the age of 17 that he had to leave in order to be able to have a future, Mustafa, his family and most of their tribe attempted to cross the border and re-settle in Afghanistan. But on the way members of the Taliban shot and killed 11 of the travellers, including some of Mustafa’s close relatives. The rest of the tribe immediately turned around and went back to Parachinar. Soon after, Mustafa decided travelling to Australia was his only hope. After paying about $15,000, Mustafa first travelled to Thailand, then to Malaysia, before boarding a boat destined for Indonesia. The capacity of the boat was 10 people, but 20 people desperate to travel to a safe land crammed into it. After spending a month in Indonesia waiting for the final leg of the journey to begin, Mustafa and about 70 others, including women and children, finally made their way onto a boat to Australia. He says the first day of the journey was comfortable, but describes the other nine days as a “total nightmare”. By the eighth day of the journey the travellers had run out of food, and by the last day they had run out of water. But to Mustafa’s great surprise, the boat reached Cartier Island on the tenth day of travelling, and after the standard Australian customs checks, the asylum seekers were taken to Christmas Island. “All I had was just a bag with one pair of pants and one shirt. My shoes fell into the sea so I had no shoes,” he says. detention centre, before being transferred to Darwin, where he was interviewed as part of the arrival process. But the initial outcome was not positive. 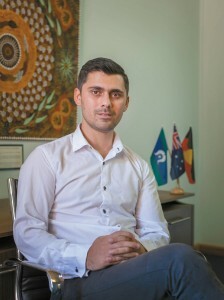 Two weeks later, however, having completed more interviews, Mustafa was told he was allowed to stay in the country and would be sent to community detention in Canberra, where he would be a part of the CatholicCare Migration Service (CMS) program. During his time in community detention, Mustafa finished his high school studies, completed a Certificate IV in community services, and volunteered his time working in aged care and at Companion House, helping people who had fled persecution as he had done. In 2012 Mustafa was given permanent residency status, allowing him to move out of community detention. After finding a home, he contacted staff at CatholicCare, who had supported him during his time in the CMS program, asking if there were any positions vacant. Mustafa was first employed on a casual basis, and then on a full-time basis as a support worker in the CMS program. After the program ceased at the end of last year, he commenced a new job as a youth worker at Marist. Mustafa says he’s happy to be in a peaceful part of the world now, but he deeply desires to have his family here too. “I’ll be getting citizenship in January, so after that I will apply for the family, because I want them all to be here with me, safe,” he says. “I’m very worried about them. Reflecting on his long and difficult journey to Australia and his new life in a peaceful country, Mustafa says he is glad he made the decision to leave Parachinar, despite the challenges of the journey. “No one should experience such things as I’ve experienced in my life,” he says. I made it, but I had to cross a lot of difficulties.